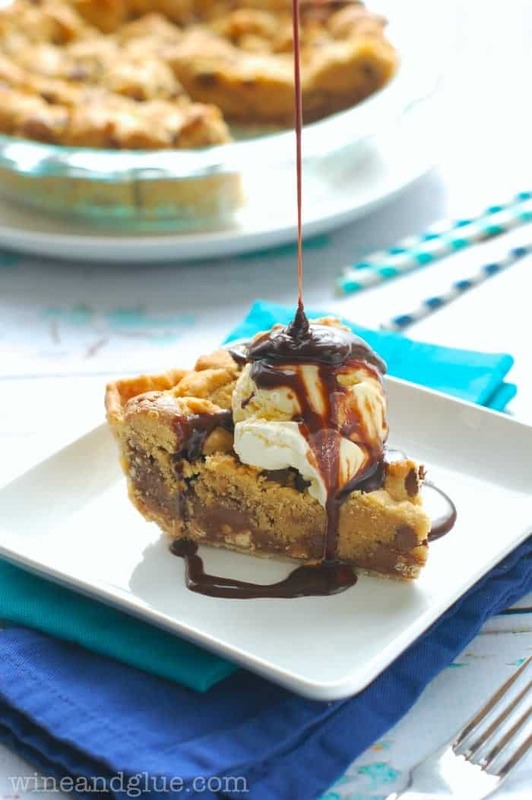 Chocolate Peanut Butter Brookie Pie | It’s a cookie! It’s a brownie! It’s a pie! So all my classes in college and grad school (except Statistics) were very Liberal Arts oriented. I wrote umpteen billion papers, and did tons and tons and tons of reading. My tests were mostly made up of essay questions, and the only numbers that really factored into my life were how much money I had left to buy groceries. So when I met Nathan and he learned I was a Social Work major, he was shocked to learn that my favorite subject in high school was MATH. Loved math. I felt like I could do math homework forever. It was so wonderful, because it was all problems that had a right and a wrong answer. So Happy Pi Day!! I’m super excited to be celebrating with a bunch of great bloggers I know, all bringing you different kinds of pie! Make sure that you visit all of their wonderful blogs and check out all the pies that they made! 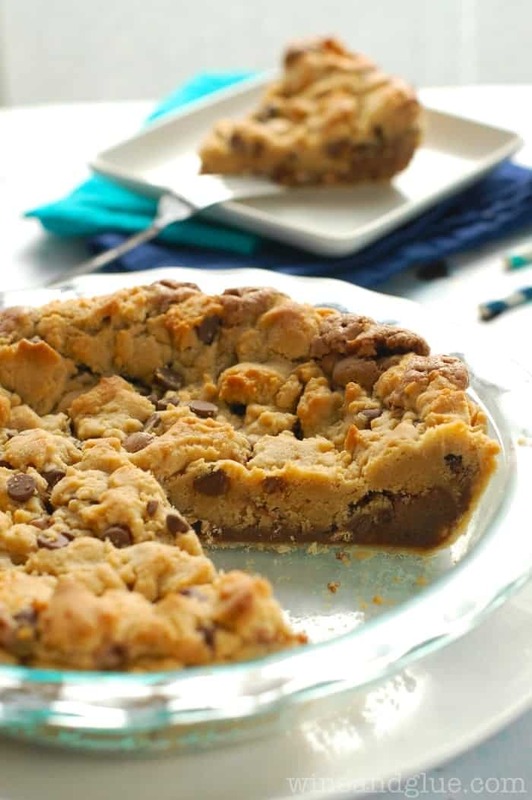 I made you this amazing Chocolate Peanut Butter Brookie Pie! Never heard of a brookie before? It’s half brownie, half cookie! And I upped the ante a little by adding peanut butter chips to my brownie layer, making the cookie layer a peanut butter cookie, and shoving the whole thing in a delicious pie crust. I had to serve this pie an eviction notice yesterday and get it out of my house so that I didn’t devour the whole thing. It is delicious on it’s own, but even more amazing when topped with vanilla ice cream and drizzled with fudge sauce. p style=”text-align: center;”>You can see all the amazing pie recipes being shared today by clicking the images below. Updated to add: This pie is baked in a very deep pie dish. This is the one I use for all my pies. 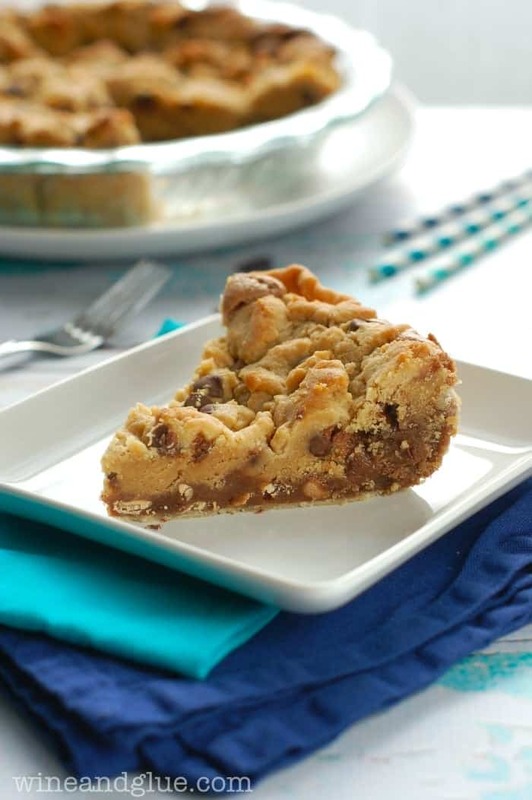 If you don’t have a deep pie plate, I suggest adding less of the cookie layer (and just making cookies out of them) or putting a foil lined baking sheet under the pie plate to catch any spilling. Additionally, the brownie layer is gooey when the pie is done. Preheat the oven to 350 degrees and take your pie crust out of the refrigerator and set aside. Start the brownie layer by melting 1/2 cup of butter (cut up) and 1/2 cup of milk chocolate chips together in the microwave. Make sure it is throughly stirred and combined. Set aside. Whisk together the two eggs, 1 tsp of vanilla, 1 cup of sugar, 1/2 tsp baking powder, and 1/4 tsp salt until thoroughly combined. Whisk in the butter and chocolate mixture. Whisk in the 2/3 cup flour until throughly combined. Stir in the peanut butter chips. Set the batter aside. Start the cookie layer by whisking together 1 1/4 cup flour, 1/2 tsp salt, and 1/2 tsp baking powder. In a separate bowl beat together 1/2 cup butter, 1/2 cup brown sugar, and 1/2 cup granulated sugar until light and fluffy, about three minutes. Beat in the 1/2 cup peanut butter until well combined. Then one at a time, beat in the egg and the teaspoon of vanilla. Gradually beat in the flour mixture until fully combined. Stir in the 1/2 cup milk chocolate chips. Spread the pie crust into a deep 9 inch pie plate. Pour in the brownie batter, and gently spread it so it is an even layer. Plop chunks of cookie dough on top of the brownie batter so that it is evenly distributed. Bake for 40 minutes, turning halfway through the baking process. Great choice for pie day. Suddenly, I’m craving pie for breakfast! Wow seriously gorgeous pie! Love it! I love it Lisa! It looks so great with that ice cream and chocolate sauce too – have pi day indeed! Oh. My. Heavens!!! This looks amazing!! I love a gooey, messy, rich looking pie just like this one!! That drizzle! Oh my goodness. I can’t stop staring. This looks amazing! Thanks for the recipe.. from everyone in my family who will be eating this pie very soon! YUM!!! Oh good heck, this looks amazing. Your pictures are beautiful too. I like math in school, until I got to Trig and then I was done. SWOON is right Lisa! This looks fantastic! Freakin’ fabulous girl! Pinned and shared on FB! Lisa, this looks just amazing!! Thank you so much for sharing at Best of the Weekend! Have a happy St. Patrick’s Day and a wonderful week! Cindy Eikenberg recently posted…Best of the Weekend! I made this pie yesterday and have some questions about the recipe. In the brownie layer the list of ingredients calls for 1 t. of vanilla but nowhere in the instructions does it tell you when to add it. I added it when the butter and chocolate mixture went it. Was that correct? Also, the cookie layer ingredients list calls for 1/2 cup creamy peanut butter but once again no where in the instructions does it tell you where to add it. Since the information wasn’t given, I realized after the fact that I’d followed the directions and never used the peanut butter. When was I supposed to add it? I did bake my pie for 40 minutes as the directions stated. Not only did the cookie dough bubble over the sides of the pie plate and all over the oven but the brownie part was basically goo. It is supposed to be or was mine just undercooked? I don’t mean to sound critical with my comments and questions. The pie, although probably not cooked enough and missing the peanut butter, was yummy and if I can get the bugs worked out would definitely try it again. Would love to hear back from you with the corrections. Sue, Holy pregnancy brain! Wow. I’m so sorry. Thank goodness for kind readers who test your recipes! The recipe has now been updated with the vanilla and peanut butter (if you are going to call something a peanut butter pie, you should probably remember to add it to the recipe . . . .). And I put a little note in there about your other concerns. I use a very deep pie plate for all my pies. I’ve had this complaint before that a pie recipe of mine was overflowing or there was too much filling for the pie. So I will be sure to add that note to all pie posts going forward. And as for the brownie layer, it was gooey for me too. It was definitely solid within the pie, (for example, you can see within the pictures that it’s holding it’s shape) but gooey. I did however, refrigerate my pie overnight before cutting into it. Though I didn’t keep refrigerated after that, and it held it’s shape. I’m totally drooling over this and I pinned it to my PIE board 🙂 Happy Belated PiDay. It’s funny….because you really do have a good balance of both sides of your brain! I can actually see the analytical (math) side a little stronger! No wonder you will never go back to social work – lol 🙂 Anyway, back to the PIE, it looks AWESOME, Lisa! Totally the kind of thing I’d devour!! Wow I totally missed this on pie day. I am a HUGE fan of Brookies right now. This is next level brookie and I just might have to try it one day! Ooooo, Nutella in this is genius! Loved this dessert. Made it for a dinner party and paired with a Bella dessert wine. It was phenomenal!! Thank you for the recipe. I’m so happy to hear that Susan!! Thank you for taking the time to come back and tell me! This looks amazing. Pinning for the near future!